This 6 cup coffee maker does not come from Bunn, Mr coffee or any of the big companies, but there would be many people that know it. In fact, strictly speaking, they are not even a coffee maker company! Well, we are talking about this 6 cup coffee maker from hello kitty and of course, its main draw is its mascot -hello kitty. Throughout my site, I have been reviewing and evaluating coffee makers, so much so that when I saw this coffee machine, I cannot help but think of checking this machine and see if it is really works. Of course, the thing that attracts me is the "look and feel" of this coffee maker, with its pink look and the cartoon "hello kitty" embossed on it, this is the ultimate female coffee machine. Personally, if you have any lady friend and colleague and they love a hot cuppa in the morning, this is the perfect gift. But, does it do good coffee? There is nothing complicated about this machine, it is a very basic drip filter coffee maker, so brew wise, it is comparable to a bunn drip filter coffee at that price range. And for drip filter coffee, other than dirty filter or uncleaned parts, if you maintained the coffee maker well, there is very little chance that the coffee can go bad. The fact that amazes me is the price, done with such elaborate design, it is retailing at $40, not much different from a basic dripfilter machine that has the same features. And this 6 cup coffee maker does comes with features that are more than the basic drip filter. Firstly, you would have noticed that it has a translucent tank with level marks, this allows for easy topping and gauging of the water amount. Then, its filter basket is removable and washable. Not only would this saves you some money on filter paper, it is a very green design aimed to reduce consumption of paper. The carafe even has a anti-drip feature, a value add that is usually found in more pricey coffee makers. 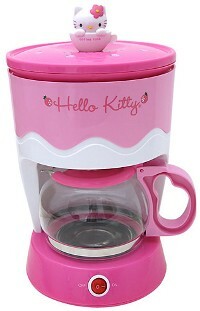 While I do not like a warmer plates for coffee machines, it is still the most common way in getting your coffee hot and fresh and this hello kitty coffee maker comes with this function. For a mere $40 and you would get a "branded" coffee maker that comes with features that are over and above most basic coffee brewers, I think this is a good value for money offer. Of course, as I mentioned many times, different coffee machines would suit different lifestyle and needs, and this is one that is specifically designed for the ladies, especially those that have a soft spot for cute things.